The digitalisation has changed our approach to research and publishing. However, this often conflicts with licensing and copyright restrictions. Academic libraries such as the Zentralbibliothek für Wirtschaftswissenschaften have to do something about this, but how? More and more academic publications these days are to be found in digital form and the relevant information should be made available quickly, directly and free of charge. The Leibniz Information Centre at the ZBW – the German Library of Economics – is one of the first academic libraries in Germany to address these difficult challenges with its 2015-2020 strategy. On its way to becoming a digital library, it is step by step converting its inventory management into an e-preferred strategy. For all its decisions on acquisition, the digital version of a publication is preferred, provided it can be accessed on a supra-regional basis and its availability can be permanently guaranteed. As an institution that is funded both on a federal as well as regional level, the ZBW fulfils a national function by ensuring a supra-regional supply of literature for Germany and is the world's largest library for economics. Its national mission to make the publication output in the field of economic science supra-regional and permanently available distinguishes it from other scientific libraries in Germany and represents a special challenge in the digital world. The ZBW negotiates supra-regional licenses, is the chief negotiator when dealing with consortiums and develops new licensing models in cooperation with publishers. Usually, this leads to publications being accessed on a limited basis, but their storage is often not allowed or only after an embargo period. This is why a further building block of e-preferred strategy is necessary – the creation of one’s own repositories, i.e. document servers, on which publications are available via Open Access. With Econstor, the ZBW already has one of the world's largest and highest ranking economic science publication servers at its disposal. 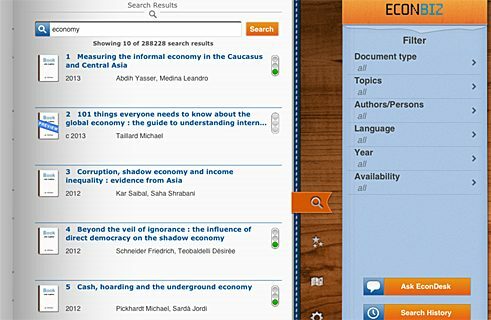 It archives selected economic science publications – primarily in PDF format. Research portal Econbiz | Photo (detail): © ZBW The Digital Archive was implemented as a new repository with the aim of depicting the entire collection spectrum of the ZBW. All common file formats can be hosted in it, archived and provided with a “persistent identifier”. Access to selected e-publications can be restricted in various ways – by region, by organisation or by time (Closed Access). It can be accessed using the ZBW research portal Econbiz. The process starts with the content selection. Afterwards it is checked to see whether the digital publication can be reliably quoted in the long term and thus be made permanently available in Open Access. In this case, confirmation is provided without storage. Should this not be the case, an open content license (OCL) has to be submitted. If submitted, the document is stored directly in the Digital Archive. Otherwise, rights of use are applied for, as a rule from the publishing institution. Normally, the request is for rights for hosting, archiving, long-term archiving and distribution in Open Access. The high success rate shows that the Open Access concept has now moved into academic systems all over the world. However, the granting of rights is made more difficult by current German copyright law. Its regulations lead to complicated usage agreements and involve a growing need for legal expertise. The use of just one single software solution would be advantageous for supporting library processes, but, as yet, no satisfactory solution has been found. Further technical developments, which would facilitate the efficient uploading of publications from the web to the Digital Archive, are in the pipeline. Apart from the technical and copyright aspects, the employees’ qualifications are a crucial prerequisite for a successful e-preferred strategy. This includes training courses on technical innovations as well as an appropriate general boosting of skills. The ZBW has had positive experiences when introducing new working processes and specific quality standards to small groups. However, there are so many different options for web publications that not all the processes can be depicted with standards. That is why the ability to deal with complexity, as well as to work creatively and in a solution-oriented way should be promoted. Experience has shown greater effort is required when processing e-publications and, thus, an increased demand for personnel. However, in the face of the digital transformation of our academic systems, the introduction of an e-preferred strategy for libraries is a significant opportunity that it is worth grabbing. Karin Wortmann is the coordinator of the ZBW's portfolio development and metadata program. Regine Lipka is a graduate librarian at the ZBW, working in the Digital Archive section. Copyright: Text: Goethe-Institut, Karin Wortmann, Regine Lipka. This work is licensed under a Creative Commons Germany Attribution – NoDerivs 3.0 Germany license.